You can buy matchday tickets online from the official site. It’s unlikely you’ll have to buy your tickets in advance and it’s easy to buy them at the stadium before entry. Only if they are playing Paris SG, Marseille or Monaco would it be better to buy your ticket in advance. Tickets start at €10 and as it’s a modern stadium every seat has a good view. If there’s no match on when you are visiting you could take a stadium tour. 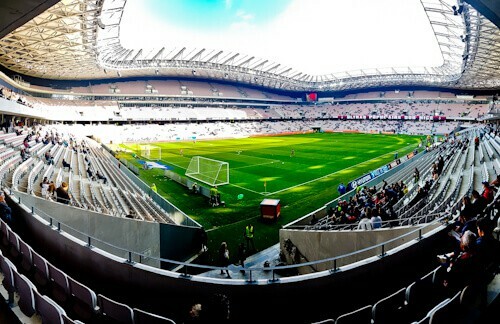 The Allianz Riviera stadium is located in the suburbs of Nice. It’s also known as the Stade de Nice. Although it’s located outside the city it is very easy to get to. Free buses are provided from around the city (see below). There is also a tram line which is due to open very soon. If you’re not a football fan, the good news is this stadium also hosts concerts. Celine Dion performed here in 2017. You would not expect Nice to have such a huge modern stadium. The stadium opened in 2013 and holds over 35,000 spectators. One of the reasons they have this stadium is because it was a major stadium in the Euro 2016 tournament. This is the stadium in which Iceland famously beat England 2-1. Other top teams which played here in this tournament were, Spain, Sweden and Belgium. The nickname of OGC Nice is Les Aiglons. This translates into English as ‘The Eaglets’ or young eagles. Before the match an eagle will fly around the stadium. If you are visiting the Allianz Riviera with kids they may enjoy this more than the football match! As part of the pre match build up the fans will sing the club hymn, Nissa la Bella. This is to Nice what singing ‘You’ll never walk alone’ is to Liverpool. The eagle flying around the stadium before the match is something which also happens at Benfica. After the excitement of the eagle flying around the stadium, the teams will appear. They walk out from the dug out and line up for photos. They will be accompanied by child mascots. If you’re planning a visit in advance with your kids, you could email the club. Let them know you are traveling from far away and it would be special for your children to walk out with the team. Who knows, you may get lucky! After the pre match line up, it’s time for the kick off. The fans are excited when the game kicks off. All you need to hope for is a good game. 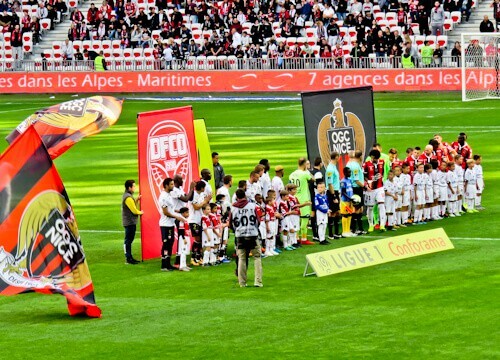 OGC Nice regularly play in Europe as well as against the best French teams. Against the lower French teams (like Dijon) you’ll see lots of spare seats (above). Where else in the world can you be guaranteed a seat for €10 in a world class modern stadium? There are plenty of kiosks selling snacks, hot dogs, french fries, Pepsi and beer. Whatever happens during the match you won’t be hungry. I must confess I had not heard of most of the Nice or Dijon players. In fact I never knew Dijon had a football team before the match. Dijon is more famous for its mustard than its football. 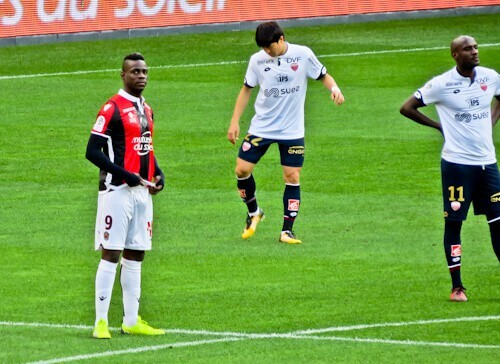 This season Mario Balotelli was playing for Nice. As when he played for Manchester City he missed a lot of chances. He did however score a penalty before being sent off late in the game. The match finished Nice 1-0 Dijon. 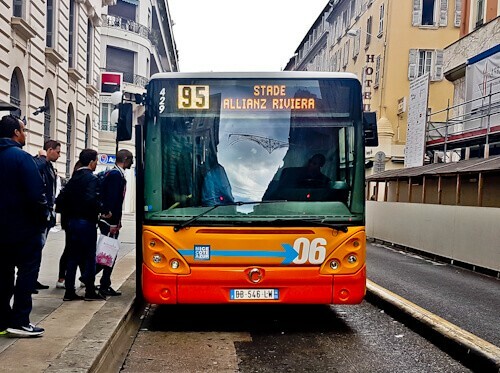 How to get to the Allianz Riviera stadium from Nice? On matchday free buses are provided to the stadium. The bus leaves from the Hotel des Postes stop near Place Massena. They operate from 2 hours before the match starts. There are machines to verify your ticket but as this is a free service you do not need a ticket or need to verify a ticket. Depending on traffic it can take 30 minutes to an hour to reach the stadium. The process of getting back to Nice is very similar to getting there. You take the same 95 bus which is labelled Nice Centre Ville. After the match there will be lots of buses lined up so make sure you get on the right one. When you reach Place Massena the bus will go a different way due to the one way system. It’s probably easier to get off at the Albert 1er stop. 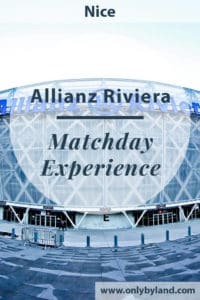 Check out the AS Monaco match day experience. What to see and photograph in Nice. Another stadium article, and a great read too! Not sure I would have included the bit about Celine Dion performing here! I’m kidding. 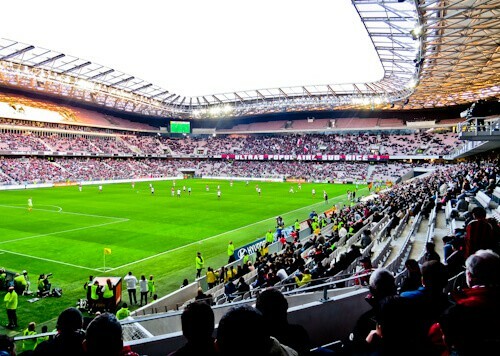 This looks like a really energetic stadium, and something different and local to see when in Nice. I am both a football fan and a concert fan so Allianz Riviera stadium sure fits my taste. Eagle flying around the playground before a match start is pretty iconic. Thanks for writing on this offbeat niche! Wow, admitted I’m not the biggest sports fan, that stadium is designed beautifully! I will definitely have to stop by for a concert next time I am in the area. I love that you show us how to get there too, sometimes that gets pretty confusing. Free buses on game day are a definite bonus! Sounds like you had an awesome time at the game, go Dijon! 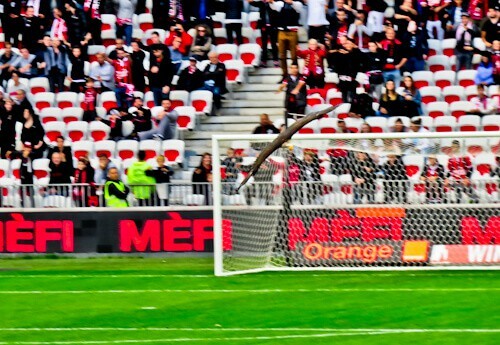 I am not an OGC Nice fan, but I do love the idea of seeing an eagle fly around pre-game! My family all went to Auburn University in the US, and they do the same thing before the games. If they had taken me to a football game before I had to choose my college, I probably would’ve ended up there instead! I haven’t been to Nice yet, but I’ll have to hit up a soccer match while I’m there! I visited this stadium to watch England play Iceland – it brings back those crazy memories! I remember we took the free bus 95 on that day and the traffic was terrible as you’d imagine for such a big match. It took us an hour to get there! Of course the stadium was full, later in Nice they closed all the bars as they didn’t want the England fans to cause any trouble. I’d love to watch a regular Ligue 1 game when I return to see how it compares. I don’t watch soccer…. nor did I know what the OGC Nice were but it’s interesting to see what goes on at a soccer game. I really like how you presented a multitude of reasons to go and visiting a modern stadium and museum would definitely be up there on my list! Plus I wouldn’t mind watching a soccer game just for the experience. Sounds like you had a great time! 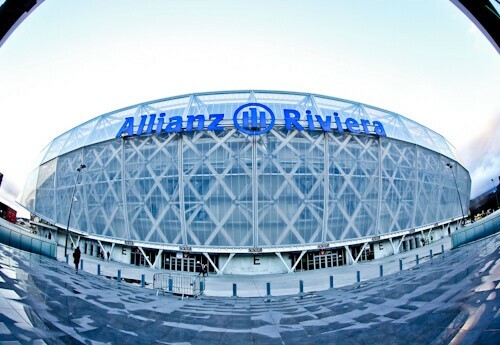 I am not a big football fan, but this Allianz Rivetia stadium from Nice is really beautiful and modern styled stadium. The ritual of flying an eagle before starting of match sounds unique. I would love to include my kids in child mascots for walking with team. Also ticket price starting from 10 Euro is a good deal. As a Dutch reader I’d love to visit the stadium where Iceland beat England! It makes me feel better because we didn’t make it to the world cup next year! Having said that I’d like to see Nice play, they nearly won the Ligue 1 last year! Hi Willem, the Iceland game will never be forgotten! Let’s hope Nice play well again this season so they have Champions League football here.